You have you ever imagine to compress all your WordPress images at once?. Yes, you can optimize your blog images with the popular and best WordPress plugin. And in this tutorial you will learn how to compress WordPress images automatically. There many other plugins which you can use, but this one is special. Because the plugin which we going to use in this article is powered by tinypng. which very famous website for compressing images. We will use the "Compress JPEG & PNG images" plugin. which can help you to speed up your website. and also can optimize your images automatically with TinyPNG. 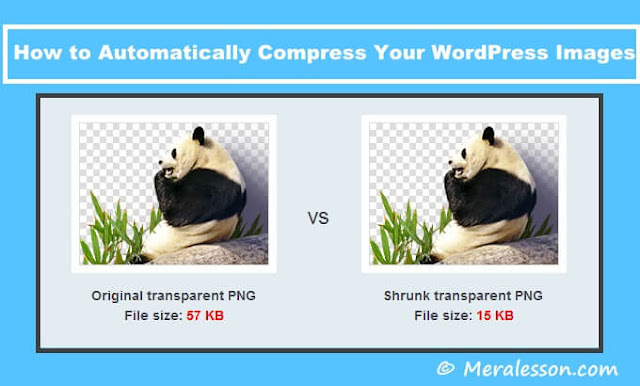 More than sixty thousand WordPress website using this plugin to compress images. If you want better results then this plug-in is best for you. so to install and integrate this plugin check below steps. The first thing that you need to do is download the "Compress JPEG & PNG images"" plugin and install and activate the plugin. once you have activated the plugin then you need to go to your WordPress settings tab. And then click on media and srcoll down to the Png & Jpeg Optimization section. In order to compress images you need to get TingPng API. So to do that, go to "TinyPng Developers page" and sign up for an account. Once you have created the account, then grab the API key. and now you can use this code to Png & JPEG Optimization section. So add the API code to text field next to TinyPNG API key. Once you have added the API key, Now you can compress all your images. So to do that, go to your Media tab and click on compress all images and click on compress all images button. So it will compress all your images. So can compress 500 images in a mouth. So this how you can automatically compress images. If you liked this tutorial then make sure to like and follow us on Twitter, Facebook. You can also let us know which plugin do you use for compressing,in the comment section below.